In a reminder that the housing sector continues to contribute to U.S. economic growth but may already have peaked, the Commerce Department said construction spending rose in February. Residential building declined slightly but was up 13% in the last year. Manufacturing continued adding to economic expansion in March with the Institute for Supply Management marking the 10th consecutive month of growth for the sector. The manufacturing pace quickened for the third month in a row with new orders, production, backlogs and exports growing faster, although hiring slowed. Survey respondents expressed optimism for demand and business conditions with lingering concerns about aftereffects from the harsh winter. 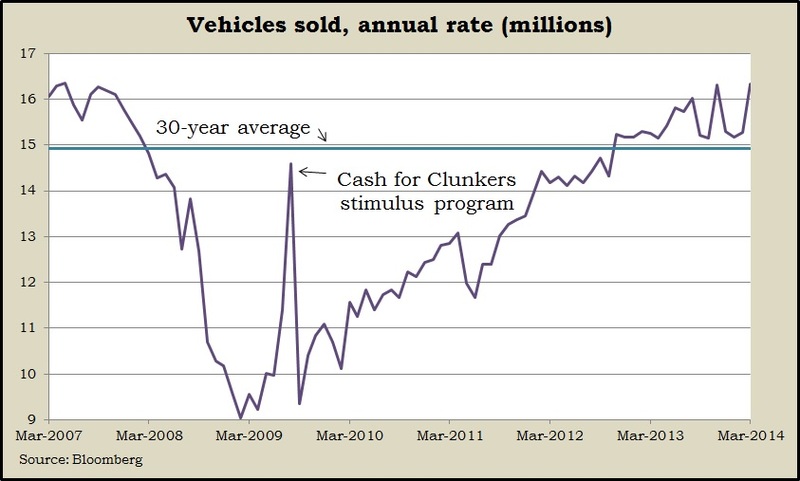 Auto manufacturers said their annual rate of vehicle sales exceeded 16.3 million vehicles in March, exceeding analyst expectations, up three months in a row and the highest level since before the recession. Domestic trucks led the pace, both for the month and compared to the year before, according to the trade group Auto Data Corp. An aging fleet of vehicles nationwide has fueled new car demand, which has helped U.S. manufacturing. For the first time in three months, factory orders rose in February. More robust than analysts had expected, the increase reported by the Commerce Department suggests further manufacturing growth. Much of the gain came from the volatile category of commercial aircraft, but other segments showed broad gains. A proxy for business investments – non-military capital goods orders minus aircraft – declined. As much as manufacturing has been aiding economic activity, it represents only about 90% of the economy. The ISM non-manufacturing index showed that largest sector continuing to expand in March, though a bit slower than analysts expected. The non-manufacturing index indicated expansion for the 50th month in a row. As with their manufacturing counterparts, supply managers said they planned on increased business following winter setbacks. The moving four-week average for initial unemployment claims rose for the first time in five weeks, up slightly from the lowest mark since the recovery low in September. Since the first week in 2013, average claims have stayed below the 47-year average, according to Labor Department data. That suggests employers remain reluctant to let workers go. The U.S. trade deficit widened to $42.3 billion in February as exports fell 1.1% and imports rose 0.4%. The figures from the Bureau of Economic Analysis showed a bigger trade gap than what analysts had expected. Contributing to the expansion was an increased petroleum deficit as well as an increase in imported services, some of which tied in with broadcast fees for the Winter Olympics. The March report on payroll jobs and unemployment suggested that U.S. economic growth is still on a modest pace. The Bureau of Labor Statistics said employers added 192,000 jobs in March, slightly above the 12-month average, which brought payrolls about 420,000 jobs shy of the peak set in late 2007. Private-sector employment eclipsed its pre-recession record for the first time, led by jobs in temporary employment, health care and retailing. The unemployment rate stayed at 6.7%, with lower numbers than the year before in those saying they’re unemployed, long-term unemployed, discouraged workers or settling for part-time jobs.